Starset Theatre is committed to a policy of widening access to its classes and activities and welcomes students and participants from all areas of the community including those from deprived social areas, minority ethnic groups, the disabled (including those with learning difficulties) and lifelong learners. Starset Theatre has an ethos of welcoming students and participants from across the social and cultural spectrum. Stage School Students are offered places regardless of gender, race, creed, colour, religion, physical impairment, learning difficulties or any other factor. Our mission is to make performing arts available to all regardless of previous experience or knowledge. Starset Theatre is committed to the development of artistic individuality. Students are accepted without auditions, as we feel that the audition process may disadvantage some potential performers and therefore not reveal their true potential. We welcome applications from disabled persons and are more than happy to discuss individual cases where potential students need guidance as to their suitability for the courses or classes available. 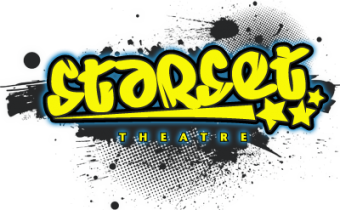 Starset Theatre is dedicated to providing a safe and secure environment for the students of its stage school classes. All staff are required to apply for an enhanced check via the Disclosure and Barring Service. Our Directors are well-versed in DfES guidance on Safeguarding Children and Safer Recruitment in Education, and have undertaken training in these areas. We use Licensed Chaperones and DBS-cleared volunteers backstage during Dress Rehearsals and Shows. In all matters of child protection, the welfare and safety of the child is the paramount consideration. Any student or parent with concerns regarding Child Protection should contact Elissa Hudson. Any personal information provided to Starset Theatre will be used for the purposes of administration, research, the provision of teaching services, the organisation of performances and for the administration of Starset Theatre’s statutory obligations under legislation relating to children. We will not disclose this information to third parties for marketing purposes, however, we may use this information ourselves to provide information on classes, courses or other services provided by Starset Theatre. By submitting an enquiry form to Starset Theatre you are deemed to consent to the use of Personal Data for the above purposes. In addition to our own cookies, we may also use various third-parties cookies in order for us to deliver additional content derived from our various Social Media platforms.